I'm not perfect. I sure wish I was. :-) And sometimes at my age, which is older now, I think I should be. "Be perfect, therefore, as your heavenly Father is perfect." (Matthew 5: 48) That is my goal--my life-long goal since it will take the rest of my life. Recently, I heard a wise priest speak about saints who have gone before us. He reminded us that they were not perfect either. They strove for holiness as we are called to do, but they also failed. They had their share of weaknesses and character defects, like us. They were human. The difference in them is that they bounced back up fast from failure, from mistakes and did not let it discourage them. We can learn to do the same as we surrender to the power of the Holy Spirit within us. Pope Francis preached today about how "God did not choose perfect people to form his church, but rather sinners who have experienced his love and forgiveness." Thank God for this because aren't we all sinners who God loves and forgives, especially as we seek his mercy and forgiveness? I know I am and He has shown me his mercy time and again so I can no longer deny His great love. He has the same love for all people. This unconditional love of the Lord cannot be taken for granted. We must remember "the heavy price Jesus paid by dying on the cross," so that we too can be resilient like the saints who became holy as He is holy. Encouraging everyone, the Pope stated, "Jesus sees the possibility of a resurrection even in those who have made so many wrong choices"...He "offers people who have made mistakes the hope of a new life, a life marked by love." I pray today you may believe that for yourself or someone you know and love who has lost hope. So how does that happen? 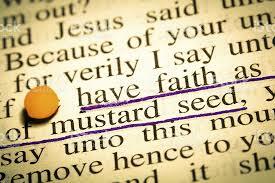 Do you want to be like the mustard seed and grow beyond what you ever thought possible? Some may think the answer is to love the Lord with all your heart, mind, soul and strength. And that is a good answer and highly important. But, I heard a very wise man say, " it is not of primary importance." Others may say, "It is to love your neighbor as yourself." "But that is not of primary importance either," he said. Although they are the two greatest commandments the Lord gave us, first things first. To grow like a mustard seed he proclaimed, "is to first accept the love of the Lord." "Could it be that simple," you ask. Yes! That's the mustard seed of faith. It is the primacy of acceptance, that is my acceptance that God loves me in Christ Jesus--to acknowledge and accept what has already been achieved by Christ Jesus. If you want to open up and receive more of this grace of acceptance, just ask for it. Pray, "Lord, give me more. Help me to fully accept the love of the Lord for myself." And trust like a child he has heard you. Expect the grace. Don't forget the God who has saved you. Remember all he has done for you. And you will grow and blossom like a small mustard seed.